﻿ Australia – a one-trick economy? Australia – a one-trick economy? 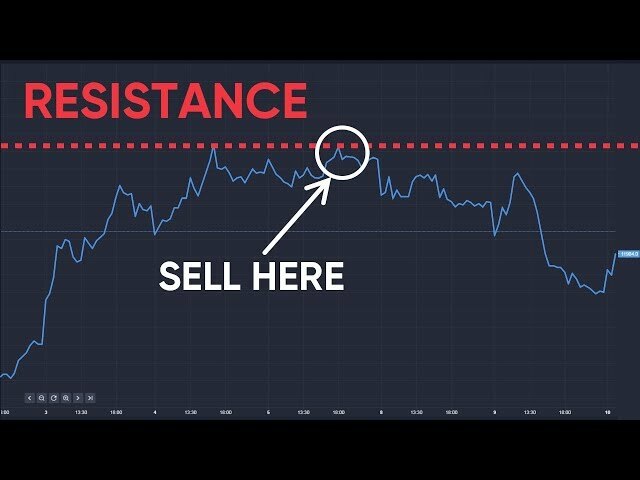 For traders News and features Analysis Australia – a one-trick economy? 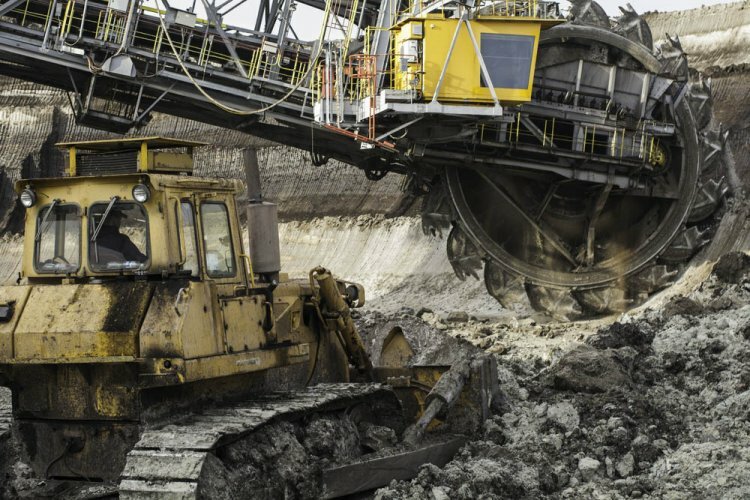 Think of Australian exports and chances are you’ll envisage a gargantuan dumper truck the size of a small house carting iron ore away from the lunar landscape of a vast open-cast mine. And not without reason. Iron ore has been Australia’s biggest export for decades – as at December 2015, it was responsible for 25% of world production. Just under 30% of the world’s bauxite – the raw material from which aluminium is made – came from Australia, too; as did 24% of global production of industrial diamonds. It is the world’s second biggest exporter of liquefied natural gas. Its red earth is rich in other metals, too – lead, manganese, gold and silver. 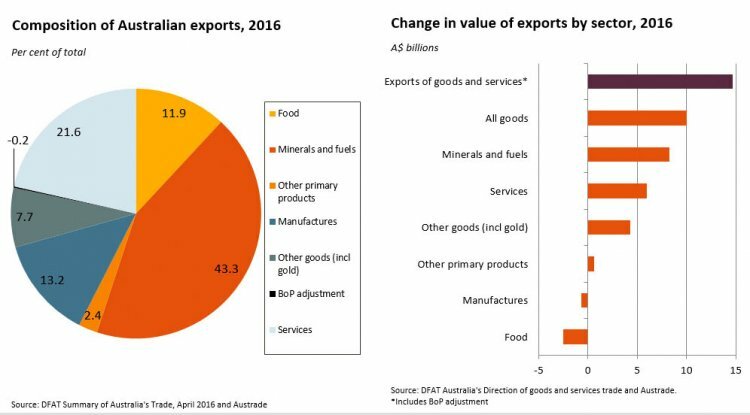 In 2016, 43% of Australia’s exports consisted of minerals and fuels such as coal, oil and natural gas – and the figure has stood at more than 40% since 2008. Of the remainder, manufacturing accounted for 13%, food 12%, and services 22%. It’s not hard to see that the country’s economy is perhaps dangerously weighted towards its wealth of raw materials. Demand for metals such as iron and aluminium is cyclical and tied to consumer demand in countries across the globe. Economists used to say that if America sneezed, the rest of the world caught a cold. For Australia, it’s China they watch for the first sign of a sniffle. In 2016 China accounted for 28% of Australian exports worth A$93bn (£52.6bn) – predominantly raw materials. This was followed by Japan at 12%, the US at 6.3%, South Korea at 6.1% and the UK at 4.5%. The rankings of the four top export markets were unchanged from 2015, although the UK did replace India for the fifth spot, mainly due to a huge spike in gold exports to Britain. In dollar terms, China accounted for the biggest rise in Australian exports. After peaking at 29% of exports in 2013 they had fallen back slightly, but started to recover strongly from 2014 on, with major increases in iron ore and coal, but also solid growth in services. In its November monetary policy statement, the Reserve Bank of Australia (RBA) warned that while growth in China continues to be stronger than expected, cuts in steel production have been introduced to deal with pollution. In the longer term, the RBA says Chinese growth, currently 6.6%, is likely to slow in coming years as the working-age population declines, and the state is less likely to use policy stimulus to maintain growth at current rates. Despite these clouds on the horizon, the RBA’s board meeting on 5 November 2017 confirmed GDP growth at around its trend rate of 3% in the September quarter, and said it is forecast to remain at that rate “over the next few years”. The RBA board left Australia’s interest rate unchanged at 1.5%. The latest data (September 2017) from the Australian Trade and Investment Commission (Austrade) show that the total number of Australian exporters continues to grow, with a 5% increase (2,454) in exporter numbers in 2015-16. The increase reflects a jump of more than 2,600 in the number of goods exporters, along with a slight fall in the number of service exporters. However, Austrade chief economist Mark Thirlwell points out that exporting is still quite a rare activity in Australia, with just 7.6% of businesses selling goods or services into an overseas market in 2015-16. 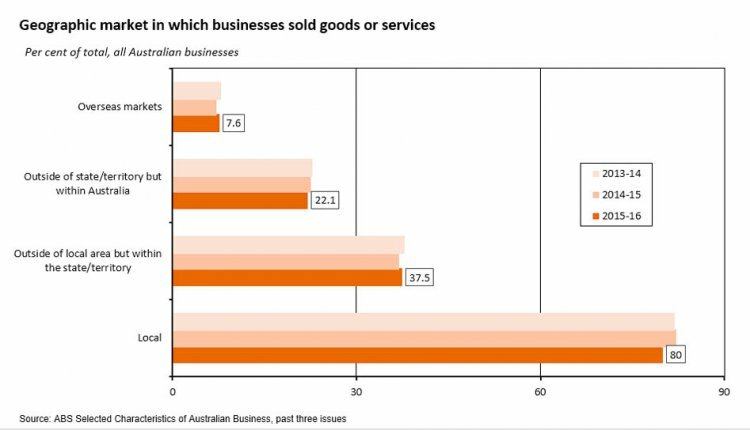 Perhaps constrained by distance, roughly 80% of all Australian business is conducted at a local level, with 37.5% taking place at state level and 22.1% at national level. “According to this data, at least, if technology has produced the death of distance, nobody appears to have told most Australian firms,” says Thirlwell. 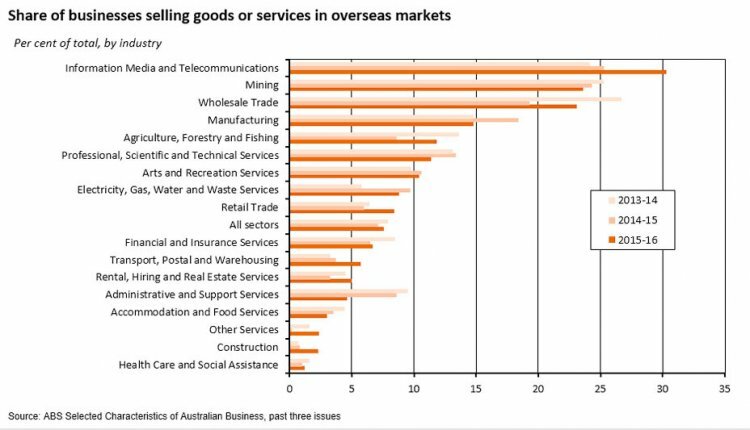 Looking at the types of Australian businesses that export the most, in 2015-16 information, media and telecommunications firms were the most active (up 5% on 2014-15), followed by mining, wholesale trade and manufacturing companies. The rapid increase in IT exports bodes well for a future rebalancing of the Australian economy, although the 2% fall in financial and insurance services from 2013-14 to 2014-15 – showing only a slight recovery in 2015-16 – is, perhaps, concerning. 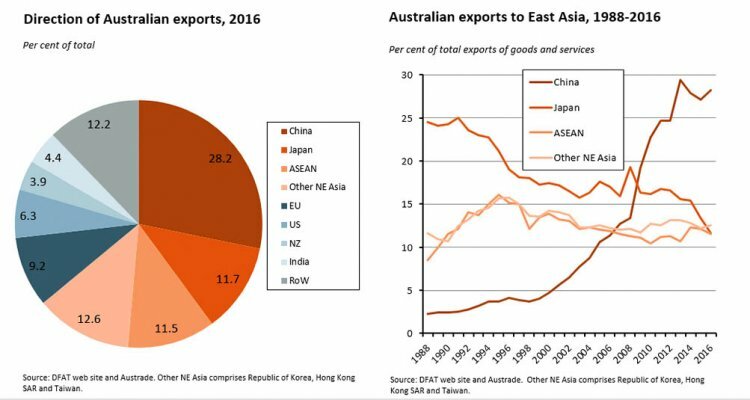 The Austrade figures show that in proportional terms, China, Fiji, the United Kingdom, the United States, Japan and Korea all saw robust growth in Australian exports in 2015-16. These results suggest there has been a positive pay-off from Australia’s recent free trade agreements with China, Japan and Korea in terms of attracting new exporters to those markets, says Thirlwell. A post-Brexit free trade agreement with the UK could boost that further. However, a relatively small number of large exporters accounts for the large majority of exports by value. If Australia is to diversify, perhaps one of the biggest potential growth areas is tourism – taking advantage of that vast and spectacular geography. A total of 7.8 million tourists visited Australia in the year ending June 2017, up 53% from 5.1 million in 2007, and an 8.7% increase of 631,500 visitors on 2016. Income from those tourists in 2016-17 amounted to A$40bn – roughly 3% of GDP – compared with A$23.5bn in 2007. Perhaps most significantly of all, 1.16 million of those visitors came from China’s burgeoning middle classes, up from just 320,000 in 2007. Other countries with a big increase in tourists visiting Australia are Malaysia, India, and the US, which overtook the UK in terms of numbers for the first time in 2017, at 706,000. 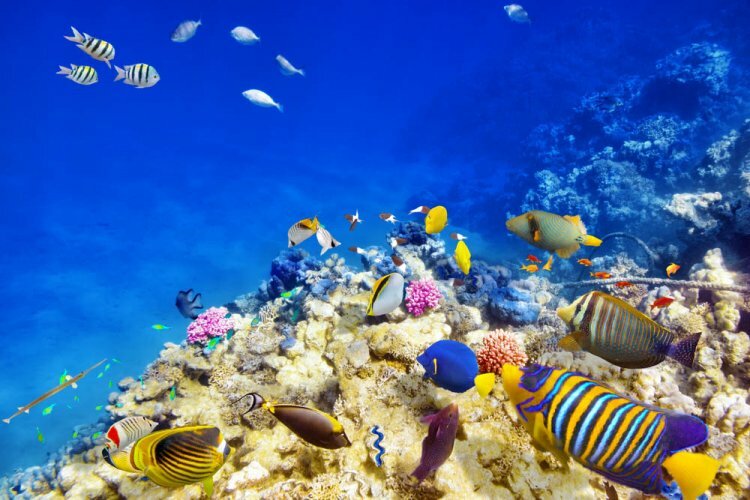 A forecast by Austrade suggests the total number of tourists each year could rise to 15 million by 2026-27, a 75% increase on 2016-17, with the total annual spend up to more than A$150bn. That rich red earth and spectacular coastline could be the answer to keeping the Australian economy in good shape for many years to come. For more information, read Mark Thirlwell’s informative blogs on exporting and the Australian economy.